Powers/Abilities: Llhupa was afflicted with lycantrophy. Unlike most victims, she was able to control the transformations into her she-wolf form. As a werewolf, Llhupa had superhuman strength, endurance, agility and speed, as well as enhanced senses and sharp fangs and claws. She was immune to all non-silver or wolfsbane weaponry but turned out to be especially vulnerable to otherworldy energy sources such as the ones wielded by Vision (Aarkus). 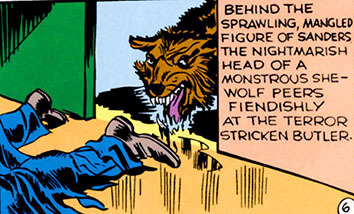 (Marvel Mystery Comics I#14/5 (fb) - BTS) - The Tibetan she-wolf Llhupa lived in the fabled and feared "City of the Howling Demons", a much storied place near the desert feared by the local villagers. An expedition comprised of wealthy Americans including Wallstreet executive Gordon Sanders came to Tibet to study the dreaded city. One night, Llhupa attacked their camp and nearly mauled Sanders before she was shot several times and stumbled off into the desert. The next day, Gordon Sanders found her in her human form and immediately fell in love with her even though the bullet wounds she suffered were in the exact same place the she-wolf had been hit at. Sanders took Llhupa back to New York where he wasted no time marrying her. It soon became clear Llhupa had infected him with the lycantrophy curse. Several times a month, Sanders shifted into a feral creature that went on a killing spree. (Marvel Mystery Comics I#14/5 - BTS) - Unaware and possibly uncaring her husband was growing desperate, she let him go visit with occult expert Martin Keller only hours before his next transformation. Keller was unable to help him in time. Sanders changed and killed Keller, but he faced the Vision (Aarkus) who was able to manifest through the smoke of Keller's dropped pipe. Sanders was no match for him and ran off, temporarily shaking off Vision. (Marvel Mystery Comics I#14/5) - The next morning Llhupa and her husband got into a heated argument when he read in the papers he had killed Keller, the one man able to help him. 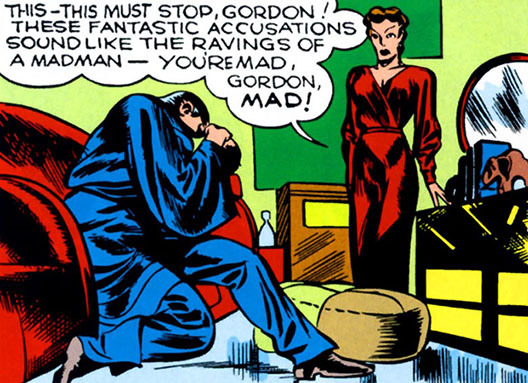 Llhupa listened to Gordon accuse her of turning him into a monster, recounting the way they met back in Tibet. However, when he began to choke the life out of her, she had to take action. Shifting into her werewolf form, she lethally injured him. In his dying moments, he stumbled out into the hall where he encountered his butler who had come to inform him their security guard Lewis had apprehended the Vision (the hero had tracked Sanders down but was surprised by Lewis and forced to come inside). The butler yelled out when his boss collapsed and died, leading the Vision to dispose of Lewis and come to the man's aid just as Llhupa in her lupine form was getting ready to make the manservant her next victim. 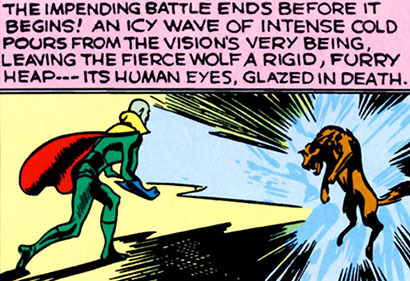 The Vision distracted her and even though she jumped for his throat, he was able to kill Llhupa by exposing her to an icy wave of intense cold generated by his own body. The attack left the fierce wolf a rigid, furry heap. Its human eyes glazed in death. After her demise, Llhupa shifted back to her human form, much to the astonishment of the butler. Before taking his leave, the Vision assured him neither one of the Sanders would return to the living world again, in any form. Comments: Created by Joe Simon (script) & Jack Kirby (co-script & pencils). Thanks to the Grand Comic-Book Database for identifying the credits. The name "Llhupa" is obviously a play on "lupine", the definition for wolflike.